I'm going to have a little fun with this page and share a few of my favorite things. I always enjoy reading other people's favorite things - whether it be recipes, tools, places, or food they love to eat. It gives you a little insight into the person but most importantly, it's just fun. So I thought I'd share a few categories of my own...let's get started! First things first - chocolate! I seriously love chocolate and rarely go a day without eating it in some form. It would be rare for me to order a non-chocolate dessert when I'm eating out. It is just about the best "medicine"/mood-booster I can think of. I don't discriminate - I love everything from "fancy" chocolates from La Maison du Chocolat, Bonnat, and Amedei to everyday supermarket chocolates I grew up with like M&Ms. I generally prefer dark chocolate now but to this day, nothing beats a bite of Toberlone! The dark selection from La Maison du Chocolat is one of my favorite things. I am always stunned by how simple yet complex it is. I enjoy every flavor. And for the past few years, maybe my favorite single piece of chocolate has been Godiva's midnight swirl. It's dark but not bitter and makes me feel good instantly. I always have plenty of chocolate on hand, for eating...and baking, of course! I often reach for Ghirardelli, particularly the 60% dark, for baking. If I want a bolder flavor, I love Scharffen Berger. I buy blocks of Callebaut, bars of bargain Trader Joe chocolate, and splurge on Valhrona feves on occasion. There's room to try everything and it all depends on your personal preference. I am crazy for nuts. Almonds, hazelnuts, walnuts, cashews, and pistachios all vie for my favorite. Every couple of weeks, I roast a mixture of nuts and keep them in a jar to snack on. I also use nuts in baking as often as I can get away with. I like buying nuts from the bulk bin at Whole Foods. Trader Joe's is a great place to pick up nuts as well. I love almost all nuts but almonds have a special place in my heart. It's like the workhorse in the kitchen that blends so well with everything. Almond paste is one of my very favorite pantry items. You're almost guaranteed to produce something moist, fragrant, and chewy when you bake with it. I'm partial to canned almond paste and Love n Bake is my favorite one. If someone asked me what my favorite ingredient to cook and bake with, I'd say eggs. It's delicious on its own whole (I'm partial to a ham and egg sandwich on toasted English muffin for breakfast) and magical separately when we think of what we can do with the whites and the yolks individually. I love eating a basic egg custard and I love eggy baked goods that highlight its flavor. I am very grateful for eggs! I'm not sure why I grouped these two together except that maybe I often eat both these things everyday (on the weekdays, at least). I love steel-cut oatmeal and I buy McCann's irish oats like it's going out of business! Recently, I've taken to mixing in a little bit of Trader Joe's very well-priced steel cut oats in with McCann's. The Trader Joe's oats isn't quite as firm but a close proxy. As for sweet potatoes, I love eating a big roasted Japanese sweet potato for lunch, with some other vegetables. It really hits the spot and satisfies my sweet-carb cravings in a healthier way. I've had a love of chestnuts since a child. Maybe it's that similar love for those Japanese sweet potatoes. I love chestnuts' sweetness and that fluffy texture. To this day, I love a sponge cake layered with chestnut cream that you can find at a Chinese bakery. It's too bad that chestnuts and chestnut desserts are not very prevalent in the States. 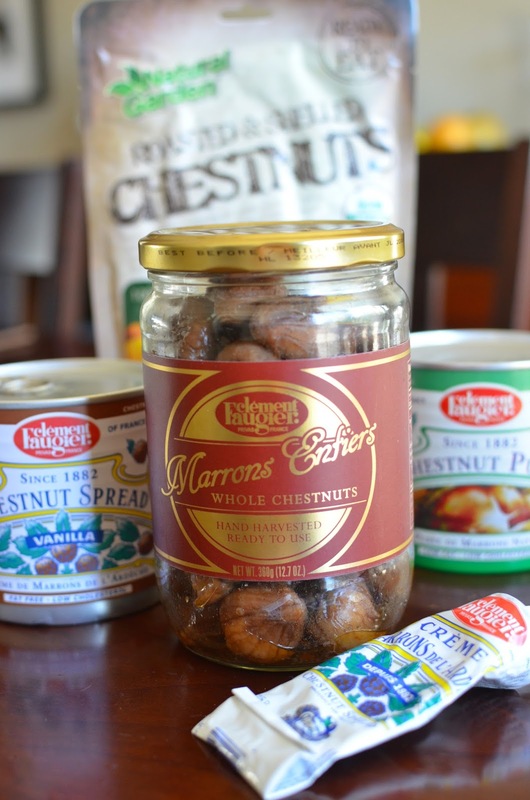 I get my fix by snacking on ready-pack roasted chestnuts throughout the year. Around Thanksgiving, you can find fresh chestnuts at the grocery stores. I like to simply boil them to eat. When you get a good batch (like ones imported from Italy), the sweet flavor and fluffy texture is hard to beat. Stepping away from food, let's touch on tools. One thing I learned about cooking is having the right tools really makes the job so much easier and increases your chances of success, and happiness. 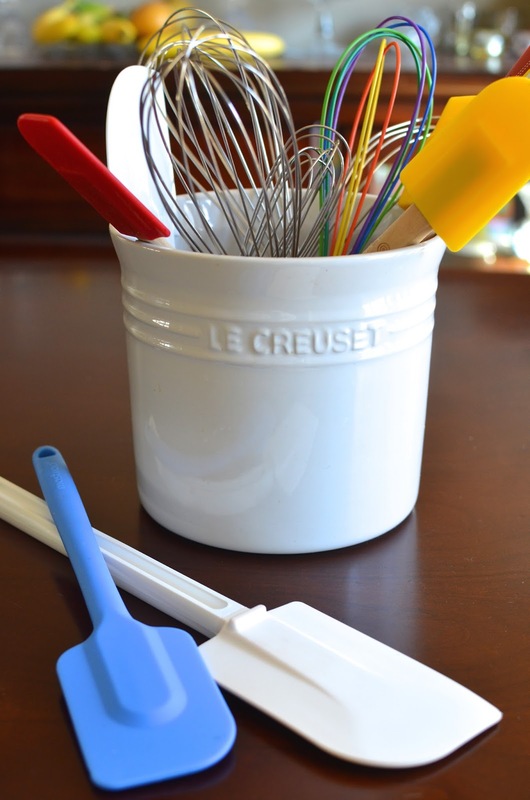 The stand mixer is my partner in the kitchen and I've come to love my blender for homemade frappucino, but of all the tools I use, I would not want to go without my rubber spatulas. I use them all the time, everyday. And many more...These favorite things I listed above barely scratches the surface of things I love. In fact, this exercise has made me realize there were so many things I adore. We often throw out "I love..." when we're describing food and ingredients but I really think it comes from a genuine place because we do love so many things! We all have a huge capacity for love - in more ways than one - and I'm sure that's a good thing! 1. Ina/Beatty's Chocolate Cake: super-moist, full on chocolate flavor, this is the classic chocolate layer cake. 2. Tri-Color Cookies: these Italian tri-color, or rainbow, cookies are a household favorite with its moist and chewy almond cake layers, apricot jam filling, and dark chocolate coating. I've turned them into cake and mini cupcakes, too! 3. Dutch Baby Pancake: we try to have this at least once a month for breakfast. It's custardy, vanilla, eggy flavor is amazing. 4. Double Chocolate Muffins with Mini Chocolate Chips: I make this all the time. It's full of chocolate flavor and satisfying for breakfast or dessert. 5. Banana Bread with Chocolate Chips: I'll buy yogurt just to make this and I do so every few months (it freezes beautifully). It's just delicious. 6. Chiffon Cake: I adore chiffon cake and desserts that showcase the flavor of eggs. I've made several versions of chiffon cake but my heart belongs to this pure version. 7. Molten Chocolate Cake: it's possibly my favorite dessert of all-time and this is the recipe I use. 8. Egg Custard: to me, it's comfort food in sweet form. I love it slightly warm and I make it often, particularly in the winter. 9. Financiers: these simple French tea cakes made with brown butter are my favorite use for extra egg whites. I have made a few versions, using different nuts, but my favorite is probably just the classic with ground almonds. I like to tuck some chestnut cream inside. 10. Whole Wheat Chocolate Chip Cookies: a warm, homemade chocolate chip cookie always hits the spot. I love many versions of this iconic treat and this whole wheat version is right up there as a favorite in my house. 11. Chocolate Hazelnut Meringue Torte: I'll let this cake represent the "fancy" cakes category. It looks and tastes complex but is actually quite easy to make. If you prefer a milder nut flavor, I've made it with almonds also. 12. Cinnamon Rolls: before I learned to make this small-batch recipe, I didn't even think I liked cinnamon rolls! Now we crave this often for the squishy soft rolls and tasty filling. My family and I have love the versions of this I've experimented with, including an incredible almond paste filling and Nutella-hazelnut. 13. Banana Muffins: These banana muffins were a favorite of ours even before I started this blog and discovered so many great recipes. It's still a favorite and my son's preferred banana baked good. It's super sweet, fragrant, and toasted walnuts provide a great pop of flavor and texture. 14. Affogato with homemade chocolate gelato: I never realized an affogato was so good! My favorite version is one with homemade chocolate gelato, a splash of amaretto liqueur, and of course, espresso. 15. Mango sago: a delicious, refreshing dessert soup that also reflects my Asian background. This is one of my husband very favorite desserts. I love it as well though if pressed to choose, chocolate wins out for me. There are many other recipes (let me sneak a few more in now: cocoa brownies, almond bread, buttermilk pancakes, almond macaroons, pistachio-orange chocolate cake, and monster cookies) that I've baked in the last few years that could go on this list but I've got to stop somewhere! I'll reserve the right to amend and expand this list because I know there are always new favorites to discovery and share.